Many people without first mouth experience still think that all ecigs are basically the same. That the differences are only cosmetic and marginal. Right: The basic operating principle is the same. Wrong: There are huge differences not only in quantity, but also in quality. It’s like saying: All cars are basically the same. While it’s true in some ways, it’s a ridiculous oversimplification in others. Like comparing sports cars, pickups, SUVs, and trucks. If you chose a pickup and evaluate some specific perfomance parameters, the results are not necessarily applicable to all cars. Especially when people’s preferences are involved. Sometimes a monolithic disposable (usually not rechargeable), sometimes a proprietary cartridge system. – Insufficient battery capacity, small amount of liquid. – Very limited selection of flavors and nicotine strengths. That’s the kind of devices PigTobacco is buying, producing, and promoting. The next step. Bigger devices that look more like “sonic screw drivers” or pens. You can usually combine batteries and atomizers from different producers. Sold also seperately. – Protective and (more or less) controlling circuits a monolithic unit with the batteries. – Tanks that can be filled with any liquid. Usually much larger capacity. – Atomizers initally disposable, today usually with replaceable cores. – Wide range of products to chose from and combine. These are the current main stream of product. Usually not from PigTobacco. Some mass produced (mainly in China). Some from smaller businesses. For many vapers good enough for permanent use. Especially since it is convenient and not very expensive to replace individual parts by other products. The currently most sophisticated, flexible, and diverse devices. Most begin as limited editions. Often hand crafted by very small businesses. Most machine tooled in small numbers. Some get cloned and cheaply mass produced e.g. in China. 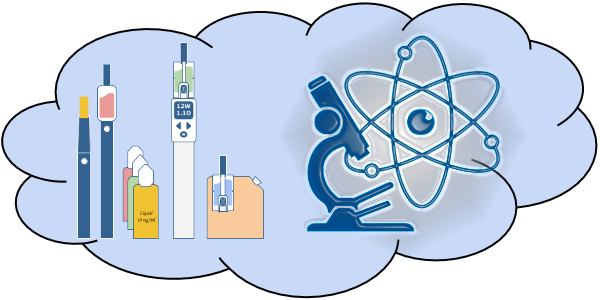 There is a wide range of atomizers. All designed for easy access to the heating coil and wick for replacement. – Control circuit (if any) seperate from the changeable battery. – Atomizers with a wide range of basic designs. – Usually can handle more power. Generate more vapor. – Tank sizes fitting any desire. From none (designed for “dripping”) to really HUGE. Most versatile but needs some basic knowledge like any other hobby. There is no fixed border between 2nd and 3rd generaion. Usually 3rd gen atomizers work with 2nd gen batteries and vice versa. But then they are limited by the capabilities of the lower level device. Some devices have properties of both generations. Like batteries that have the circuits integrated but can handle more power. Some cheaper mods can handle only a relatively low maximum power and work well with 2nd gen atomizers. The same for some inexpensive rebuildable atomizers. Only designed to handle the lower power range. This may sound just like a quantitativ difference, but it all has a very great influence on the quality of the experience. Especially on the taste and the texture of the vapor. E.g. some liquids that taste only mediocre in one atomizer might taste exquisite in another. Or worse. And all devices can only be designed to work in a certain power range. Operating them outside will either not work at all or fail to produce the desired result. So, ignoring these differences by just refering to “ecigs” in general terms often is an oversimplication that loses a lot of valueable information. Especially when people’s experiences are queried. A lot of anecdotes confirm that many people who say “I tried them, but found them lacking” had the same erroneous basic assumption about the differences and tried only some of that disposable junk. Studies that arbitrarily select one specific type of device are like studies on a specific type of pickup: The results are not necessarily applicable to other types of cars. 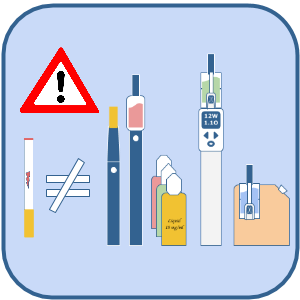 Surveys that query only for ecigs in general often have inconclusive results and they aren’t really applicable to the different generations. And since most people still aren’t aware of the differences, you need to be explicit in explaining the meaning of the questions.